In this study, cobalt/graphite-polyvinyl chloride (Co47.5/C47.5-PVC5) composite electrode was fabricated by mechanical alloying technique. The fabricated electrode and graphite rod were used as anode and cathode, respectively, in the decolourisation of aqueous C. I. Reactive Blue 21 (RB21) and synthetic textile effluent, containing a mixture of azo and anthraquinone dyes. 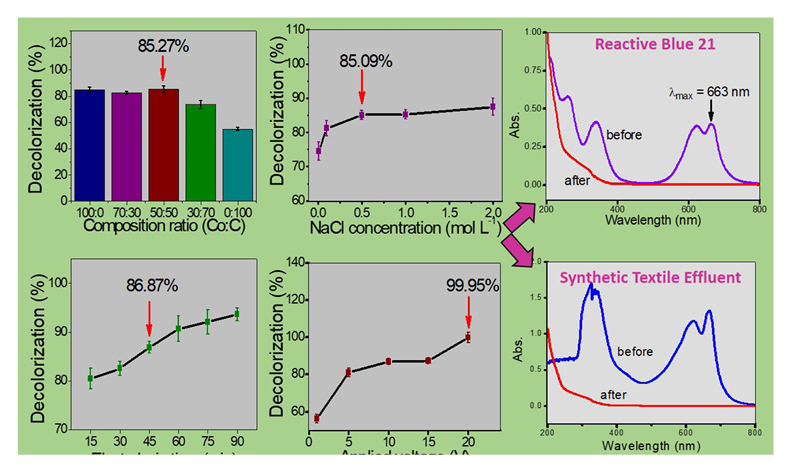 The fabricated electrode showed high efficiency in the decolorisation of aqueous RB21 (99.95%) and synthetic textile effluent. This is further confirmed by the high reduction percentage (>75%) of COD and BOD5 for both treated samples. The elemental composition study by using FESEM-EDX showed no significant changes in the composition of elements (C, Co and Cl) in the freshly fabricated electrode and after electrolysis of synthetic textile effluent. This showed that the fabricated electrode has a high mechanical strength and strong binding ability between C and Co due to the use of PVC as a binder.